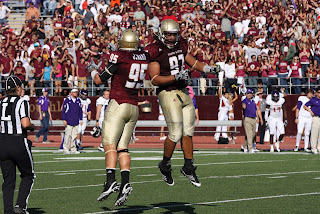 Official Blog of Texas State University - San Marcos Department of Athletics. D.J. Hall, Michael Chambers, Jon Vernon, Steven Kenney are all gone (DJ getting ready for camp himself in Jacksonville). Those four seniors from last year’s team leave voids at both starting guard positions, left tackle and center. Just as the Bobcats addressed the defensive line in the most recent recruiting class, the coaches also put a big emphasis on the offensive line signing four freshman and one junior college transfer (Tyler Potter). In addition to the new o-lineman, there will be seven players who are coming off of redshirt years PLUS two players (Adley Eshragipour and Jeff Clermond) making the transition from defensive lineman to offensive lineman. Of these 14 “new” players on the o-line, the average height is 6’3 and average weight is 287 pounds with 9 players 6’4 or taller and five tipping the scales at over 295 pounds. That’s a lot of beef not counting returning starters Charlie Will Tuttle (who earned a full scholarship after his impressive red-shirt freshman season last year) and Thaddeus Watkins. The Bobcats will certainly need the depth to go up against big, fast and skilled d-lines of their FBS opponents this season and help pave the way for a rushing attack which averaged 195 yards per game last season, but more importantly keep the quarterback upright. The o-line gave up 21 sacks last year, 7 fewer than the season before. If that number goes down even further this season against this schedule you can count that as a successful year for men up front. Speaking of quarterbacks…there will be an intense competition for the starting job this fall. Shaun Rutherford and Tyler Ardnt would appear to be the front-runners for the job, Rutherford after starting the majority of Texas State’s games last year (12 TD, 4 INT, 144.7 efficiency rating and over 1,600 yards of total offense) and Ardnt because he has 8 career starts himself and according to the coaches made some huge strides during the Spring. And there’s also JUCO transfer Duke Delancelotti (’12 Spring Game: 10-16, 149 yds, 2 TD) and Jordan Moore who’s capable of making huge plays with his feet, always important in this particular offense. As for who gets the job, your guess is as good as mine. If there’s a favorite right now the coaches haven’t said as much but that’s probably because they’re looking to make a full and complete evaluation over the next month before making that decision. I would also venture that we will see more than one quarterback man the offense this season with substitutions made based on certain offensive packages and game situations. I don’t think the expectations are for the starter to be a 300-yard-a-game passer with 35-40 pass attempts, but rather one who A) protects the football, B) is pocket savvy, C) makes the right reads in the option and D) protects the football. If the quarterback is going to rack up some big passing numbers, odds are Chase Harper will be involved. 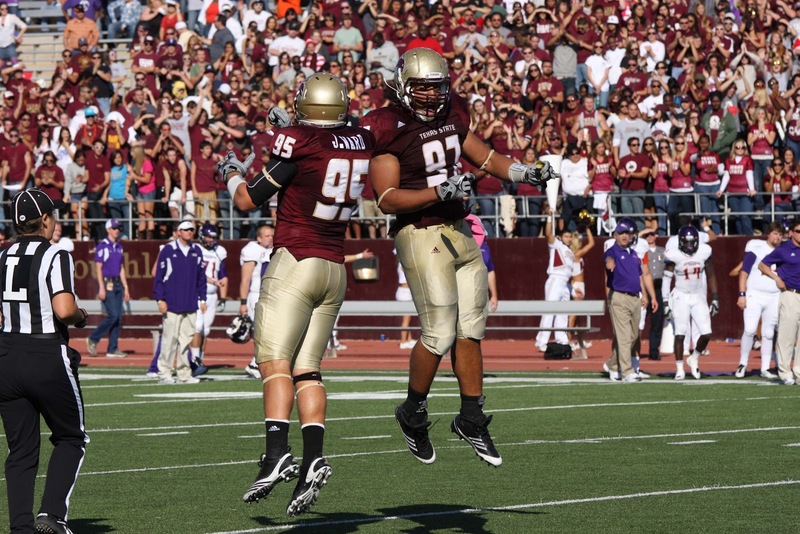 Texas State’s 2nd year tight-end hasn’t played a down of FBS football yet has been named pre-season 2nd team All-WAC and to the John Mackey Award Watch List, an honor given to the nation’s top tight end at the end of the season. Harper is deceptively quick despite his large frame (6’5” 260 lbs). He’s an extremely powerful run blocker and may have the best hands on the team. On top of that (as we mentioned in #8 of the countdown) the coaches are looking to use Harper on defense in obvious passing situations at defensive end to send him after opposing quarterbacks. His numbers from last year (20 catches, 287 yards, 3 TDs) look modest, but keep in mind that Bobcat tight ends the previous three seasons COMBINED had 34 catches for 331 yards and 4 TDs. I would expect Harper’s stats to be even better this season despite the step-up in competition. There are a lot of players fans should be excited to see this season but Chase Harper could be the best of them. May even play well enough to earn a spot on this list. Watch out for #19 (Chase is changing his number from 88 to 19). I’ll keep this brief in order to let the pictures speak (mostly) for themselves. A lot of work has been done to get Bobcat Stadium ready for the program’s FBS debut. With the seating capacity increasing by about 13,000 and Texas State’s killer home schedule, attendance records will be smashed this season. The TEXAS…STATE chants will be louder than ever. 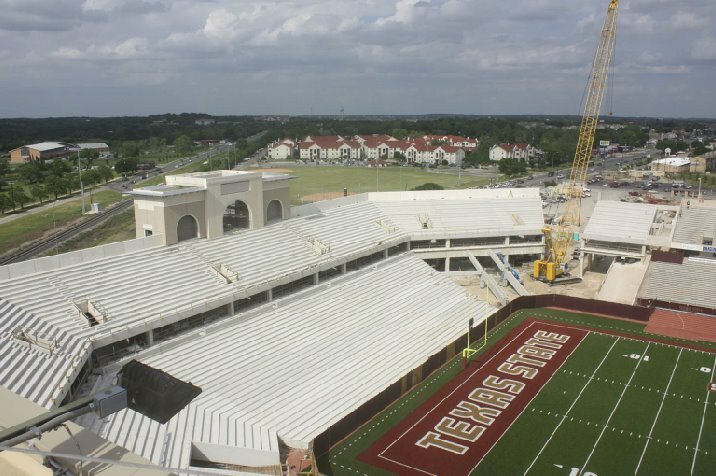 State-of-the-art audio and video boards, brand new amenities…everything has been done to give Texas State fans a true college football experience. I don’t think they will be disappointed. With at least four games on television the Bobcats will receive plenty of exposure in their inaugural FBS season and every week a new challenge will arise and will give Texas State Football the opportunity to prove itself in the FBS. They will travel from the east coast (Navy) to the west coast (San Jose State). The ‘Cats will battle the Big XII (Texas Tech), the Mountain West Conference (Nevada, New Mexico) and even square off against a former Southland foe (Stephen F. Austin). Texas State will play into December (New Mexico State) and will go to war against their I-35 rivals for the first time ever on the gridiron (UTSA). 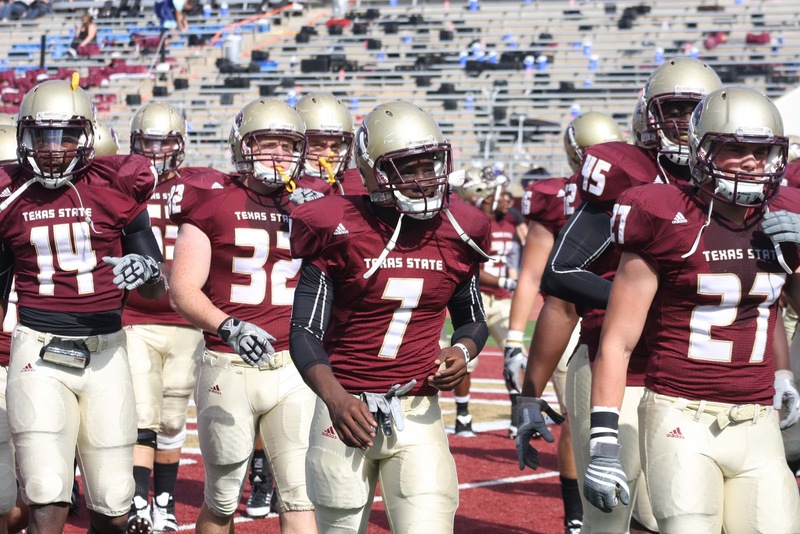 College Football fans from nearly every corner of the country will get to know the name Texas State. The 2012 season is the most highly anticipated season in the history of the program and one that will never be forgotten. Welcome to FBS football Bobcat fans and get comfortable, because we’re in for a long and extremely fun ride. Well bobcat fans, Texas State has been an official member of the FBS for a few weeks now and the highly anticipated 2012 football season is less than a month and a half away. Couple that with the construction of Bobcat Stadium nearly complete and these are some exciting times at our University! For more on the significance of what the “move up” means, check out my interview with Associate AD Don Coryell online at KGNB’s website. Texas State is up against a really tough schedule this season, the toughest the program has ever had (which of course comes with the territory of being an FBS school for the first time). To ask the offense to drive 80 yards multiple times week in and week out will be difficult. Turnovers will help create short fields (the Bobcats were -7 in TOs this past season, a number Coach Fran has pointed out must improve) but the return game can be a huge asset in this department as well. I think it’s flown under the radar a bit, but in the past few seasons the Bobcats have been really good at returning punts and kicks. Did you know that Texas State has had at least one kickoff return or one punt return for a TD in each of the past four seasons? From Karrington Bush to DaMarcus Griggs and last year Isaiah Battle and Andy Erickson the ‘Cats have made opposing special teams units nervous. Speaking of punting, the Bobcats will start just their fourth different punter since 2003 this season while place kicker Will Johnson (who could also do some punting for the Bobcats) will prepare for his second season kicking field goals and handling kickoff duties. 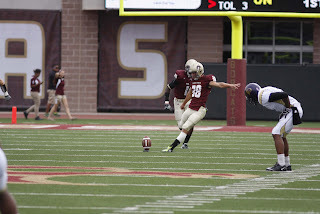 Johnson was 13-24 on FGs as a freshman (5 FGs from 45 yards or further) and had 17 touchbacks on kickoffs. I don’t think many people thought that by the end of the season last year that Terrence Franks, a redshirt freshman who’s career high season yardage in high school was 688 yards, would’ve led the Bobcats in rushing but he did. The former track star from Angleton had 863 yards with a 5.9 yards per carry average and 9 TDs. An explosive back, Franks had 8 rushes of 20 yards or more including runs of 74, 58 and 22 yards at SE-Louisiana en route to a 234 yard day against the Lions, a Texas State freshman record. Marcus Curry (when healthy) has proven to be a playmaker as well finishing third on the team in all-purpose yards last season in limited action racking up 736 yards (63 yards/game). 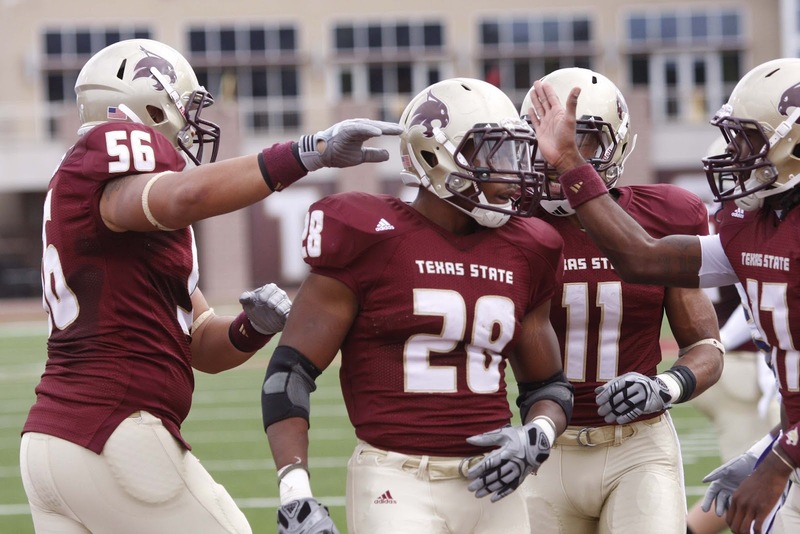 Chris Nutall looked good in the Spring and with Dexter Imade returning from injury this season, the Bobcats should have plenty of options in the backfield and those running backs will serve a crucial component of Texas State’s spread option offense. When training camp opened last season, not many knew who Michael Ebbit was. He was a transfer from Texas A&M where he really didn’t get the chance to play. He wasn’t listed on the two-deep going into the opener at Texas Tech and was thought of being just “a guy”. It didn’t take long for Ebbit to shed that label, totaling 11.5 sacks and 15.5 tackles for loss. Consider that the season before that the Bobcat team had 13 sacks TOTAL. Problem is, last season was the only one for Ebbit in a Bobcat uniform and Texas State is left looking to replace that production. Defensive Coordinator Craig Naivar is known for having an aggressive defense, looking to get pressure on the quarterback from all angles, blitzing linebackers, corners and safeties. While that shouldn’t change this season, the more the ‘Cats can get pressure with their front four, the more other defenders can drop back in coverage and the defense as a whole will be more effective. We just touched on a couple in Taulelei and Evans but that’s just the tip of the proverbial iceberg. Between last year’s redshirts, incoming JUCO transfers and a few freshman (assuming a good chunk of freshman will be redshirted this season), the Bobcats will be as deep as they’ve ever been. A lot of coaches have expressed excitement about RS Fr. Linebacker Joshua ‘E Robinson who had an impressive spring and fellow RS Fr Matt Freeman is expected to start on the offensive line. The true freshman recruits, such as OL Ryan Melton and DB Martell Summers (a pair of three-star recruits) could be players to watch out for as well should the coaches choose not to red-shirt them. In road games last season, Texas State’s opposition averaged just over 18,000 fans (a number inflated by the opener at Texas Tech, take away that game the average plummets to under 11,300). The teams the Bobcats will visit this season combined to average nearly 25,000 fans a game. 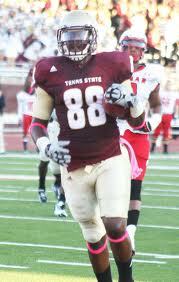 The Bobcats will play two bowl teams this season BOTH here in San Marcos (Nevada and Louisiana Tech). 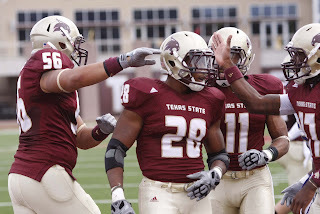 You will not look at Texas State’s 2012 schedule this season and think of the word cupcake. This is going to be a tough yet challenging and fun schedule. In the words of NFL linebacker Bart Scott…well, you know. We’ll round out the top 10 in the next blog coming soon. Until then…Eat ‘Em Up! The Drive is more than new buildings and championships. It's an increased sense of pride. The essence of Texas State makes this school one of the best universities in the country. Get Loud, Be Proud! It's A Great Day to be a Bobcat!